Congratulations! Your copy of the Awakened Money Manifesto will arrive in your inbox in the next 10 minutes. While you wait, please read the short page below. "I'm On A Mission To GIVE You Abundant Money And Spiritual Wealth. I'm On A Mission To TRANSFORM Your Relationship With Money. I'm On A Mission To Set You FINANCIALLY FREE... To EMPOWER You With Money. It's Not Just About Your Wealth... It's About What You Can GIVE BACK With That Wealth..."
This world needs your passion, your purpose, your mission, and your spirit. Money has the power to give you this. Awakened Wealth is the answer. It's not just about your wealth. It's not just about you making more money. It's not just about you having a greater spiritual connection to financial prosperity. Those will come. And you will benefit greatly. But this is about everyone. EVERYONE. For years, I've taught people how they can help themselves by making more money and achieving more success. But I now know a new truth. You don’t need more awakened money in your life just because you want more money. You don’t need more awakened money in your life just because it gives you freedom. Money by itself is neutral. But Awakened Money… combined with your own awakened relationship with money… means that you now have power you never had before. You have the power to do good in this world. And yes, you will have the power to live any lifestyle you want. And yes, that’s a nice bonus. It’s time to transform your relationship with money. It’s time for you to learn the 8 Laws of Awakened Wealth. There are 8 simple laws of money that I’ve learned and mastered over the years. But it’s only now, as I understand these new truths, that I get how they fit together. And I’m going to share all 8 with you in a way I’ve never done before. In 30 years, I’ve never given anyone what I’m giving you access to today. These are not your ordinary “laws” of money. These are the laws that Awakened Millionaires live by, prosper by… and make an impact with. These are the laws that will decide how much money you make… or how much money you miss out on. It’s my mission to awaken this wealth within you. But you are the one that must take action. At a small invite-only event in Utah, I shared these 8 secrets for the first time. But it was all caught on video. And I want you to have a copy for yourself. Originally, I was not going to share this. But the event was magical… inspired. I laid out some awakened secrets I’ve never shared before. And, as you’ll see, the people there got it. They knew exactly how powerful the secrets were I gave them. I don’t want these to be secrets anymore. 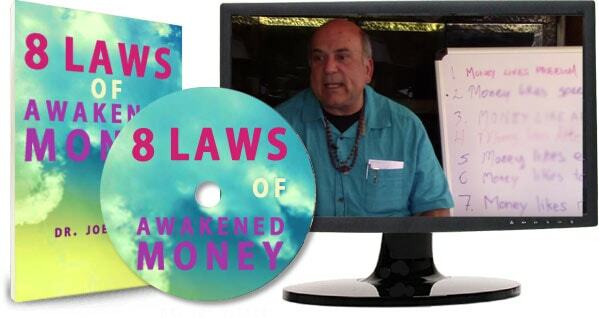 I want you to have them so you can become a master of Awakened Wealth. So you can prosper… so we all can prosper more. If I’m on a mission to awaken the wealth within you… why not just give you these secrets? Because investing in this actually pushes you to USE them. I need to know that you are committed… and you need to know you’re committed… and the Universe needs to know that you’re committed. But the investment is small. The investment is only $9. But that hour will blow your mind. More importantly, that hour will give you what you need to achieve Awakened Wealth. It will give you the power to make more money… spiritual money. If you use it… it can usher in a new chapter of prosperity and impact into your life. We need you to be successful. We need you empowered to make a difference. And it all starts by helping yourself, transforming your relationship with money, and learning how to make more of it. P.S. As always, you are backed by a money-back guarantee. If my mission isn’t your mission, let me know and I’ll give you your investment back, no questions asked. But I’m quite sure you’ll have no desire to take me up on this. P.P.S. These 8 laws of Awakened Wealth have never been revealed before. But their power to transform you into a spiritual money-magnet are undeniable and proven. I am the proof. Do it for yourself. Do it for us.